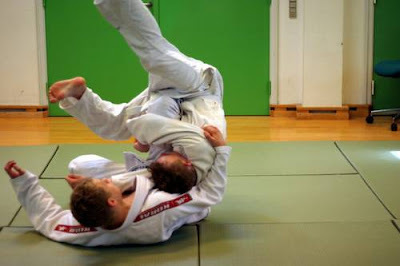 This is an alternative way to sweep from the scissor position in the guard. I really like it a lot because people don't expect it and also it's very easy to make your opponent go flying a little, which we all know looks super cool. I start out in the normal position for the scissor sweep. Instead of sweeping him to my left, I grab his left wrist with my right hand and grab his left bicep with my left hand ready to do a basic armdrag. This is the armdrag position from another angle. With my left arm I pull his arm all the way across my body and release the grip with my right hand. With my right hand I reach over his back and grab his armpit then release the grip with my left hand and use it to sit up. It's really important that I pull him in thight with my right arm here, otherwise he can easily get his left arm back around my back and escape. When I'm sitting up, I hold him as thight as possible to me, then roll back and kick up with my right leg. This will easily lift him off the mat and take him to my right. Look at him go! :) It might look like a muscle move, but it's purely leverage and no strength is involved. Just remember, you never wanna PULL your opponent anywhere, but instead keep him thight to you and then move yourself. When he's all the way over, I secure cross sides position.